While not in the frame of mind to taste cocktails tonight, my condition lead me to come up with a drink to contribute. Make tisane. Add gin. Stir in honey to taste. Garnish with slice of lemon. Enjoy soothing on throat. 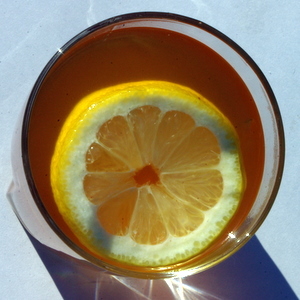 This is my basic hot toddy recipe, although I usually use black tea and 2 ounces of rum. I chose to use 1.5 ounces of the gin because of the stronger proof of the Beefeater 24. I think the ginger and 24 make an excellent pairing. This is probably the first gin toddy I’ve made, and I’ll definitely be making more of these in the future. I do hope I won’t be sick, just wanting something warming. No, I do not have Swine Flu. No, you are not the first person to ask. Herbal tea. Who me, pedantic?